Poynter Landscape Architecture & Construction. 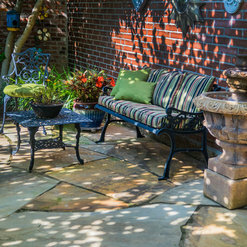 We are a fully licensed and award-winning Residential Landscape Architecture and Construction firm specializing in residential outdoor living. We build complex multi-trade endeavors and modest everyday ones, throughout St Louis, and the surrounding 100 miles. 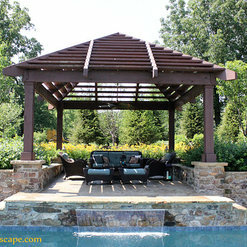 By employing a slightly different approach for these types of projects, you receive the best expertise in design, horticulture, and craftsman construction, plus all the follow through your project deserves. 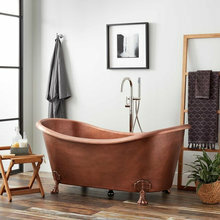 We believe good design serves both beauty and function. We believe in hiring the best design and craftsman talent. We believe in getting things done right the first time, and making things right if we ever don't. 8 Time PLANET National Environmental Improvement Award Winner 2011 At Home Magazine Architect & Designer Award for best Swimming Pool 2010 At Home Magazine Architect & Designer Award for best Swimming Pool Spa & Water FeatureReaders' Pick for "Best Landscape Designer"
We contacted Poynter to help us solve a drainage problem caused by our builder. At the same time we had them prepare a master plan for the entire landscaping around the yard. We had them do the first phase which was to repair the drainage, make it look aesthetically pleasing and provide some privacy from the side walk. They did a fantastic job and we have followed their master plan in other areas. As a follow up we had a couple of junipers die due to the early spring and late freeze... Immediately Poynter came out and replaced the junipers, checked the health of the others. Unexpectedly they cleaned up the area and remulched. Wow! We are very happy with Poynter. Al, I am thrilled to hear that the drainage issue has been resolved. There is nothing worst than having standing water in your backyard! Please keep an eye on those new trees, and let me know how the others are doing through this heat. I look forward to meeting you soon to discuss the next phase this fall. What a wonderful job! This was our second time working with Poynter. 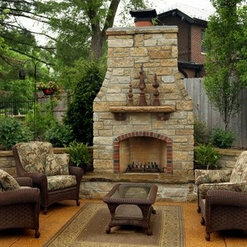 We were thrilled with their work on our previous home so we did not hesitate to hire them again. Our project was small, reworking our flower beds and putting pavers over our concrete patio. We love the results. Everyone was easy to work with and very professional, any questions or concerns were immediately addressed. We would definitely use Poynter again. Thank you, Carol. We appreciate you calling us again after you moved from your old house. Glad we met your goals of having lots of color, but with low maintenance! Poynter was involved in a large backyard project including the creation of a rubber mulched play area, complete front and backyard landscaping surrounding a pool that was being installed as well as the replacement of an asphalt driveway with a stamped concrete driveway. They have been amazing. 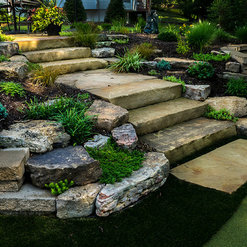 We have worked with a number of landscaping firms and we cannot say enough. They were on time, respectful, professional and most importantly communicated with us every step of the way on this large project. We absolutely will recommend them to everyone. You get what you pay for. We had Poynter do our front landscaping about four years ago. We were very pleased with the designer, work crew, and follow through. We did a large overhaul on our barren backyard this past spring/summer. Again, we hired Poynter. We felt that although expensive, we would be taken care of. Our project included removal of an old cement walk out from our lower level, a tree line installed along our back fence, numerous beds, plantings, stonework including a knee wall, columns, and a walkway. I always enjoy working with the professional staff. 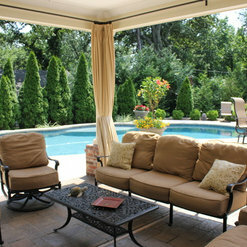 The install crews work extremely hard and are there to please the customer. I highly recommend Poynter for landscaping/hardscaping needs. 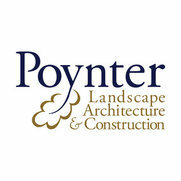 The whole team at Poynter Landscape Architecture & Construction was great. The project consisted of solving a large storm water runoff problem along a newly installed driveway. 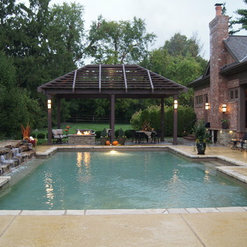 From the estimate through completion of the project everyone was very professional. The project was completed in a timely manner and it looks outstanding. I highly recommend Richard and his team. 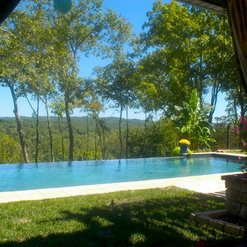 We hired Poynter to redesign our backyard and pool area. There were some difficult aspects to the job -- disparate elements, lots of concrete, and awkward angles -- but the design Richard and Bob presented was thoughtful and beautiful. Poynter respected our budget, worked quickly, and were amazing about keeping us informed every step of the way. We are extremely happy with the results. This is a company that does excellent work and goes the extra mile for the client. We highly recommend. 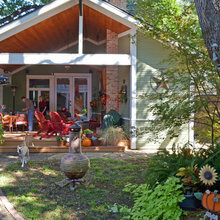 Poynter has completed a couple of different projects at our house and they manage to exceed our expectations every time. I could not be more happy with the service that we receive from Poynter, incredibly professional and do a great job. 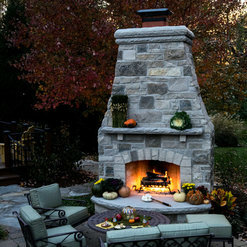 Our project included: re-grading portions of the back yard; constructing a stone fireplace, with stamped concrete patio and steps down to our lower deck area; new irrigation system; new LED lighting; fencing; and landscaping including new plantings and trees. Poynter and their sub-contractors were excellent in the performance of their appointed tasks. 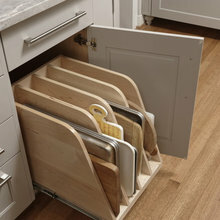 All of Poyner's personnel, including the sub-contractors, were very trustworthy and responible, as well as very willing to adjust to changes or special requests. All in all, this was a very involved project with many parts, and it went very smoothly. Richard Poynter, Bob Wilhelm, and all of the other Poynter personnel were most responsive to our design criteria! 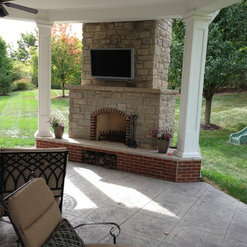 We recently completed a large outdoor renovation project with Poynter Landscape, and they did a superb job. We renovated a pool, redesigned and replaced our pool deck and entire back yard hardscaping and landscaping, installed underground drainage to correct oversights made by our home's original builder, replaced our driveway and front sidewalk, and modified our front garden beds. We were looking for a single provider who could design and manage the entire project for us. One look at the draft plans and I knew we had found the right company. Their plan addressed all of our needs and suggested many ideas we had not even considered. They managed the project flawlessly, coordinating all subcontractors, project adjustments, and final quality with minimal involvement on our part. The project ended on-budget, and we couldn't be happier with the results. 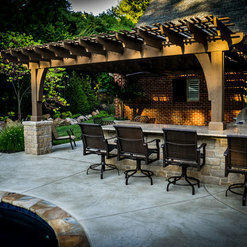 Our salesman, Bob Wilhelm, was very enjoyable to work with, and Rich Poynter (owner) was frequently on-site and very involved in the entire project. The Poynter crews - both the subcontractors they selected and their own installation crew - were very professional, courteous, and patient with our endless questions. Highly recommended ... its hard to imagine a project of this magnitude going more smoothy. We have worked with Poynter on a recent project. They are respectful, timely and very, very knowledgeable. Bob was easy to work with, communicate with and brainstorm ideas with, which resulted in the best possible outcome for our client. Thank you Poynter!! Cheers to many more successful projects together! Poynter Landscape Architecture and Construction did an amazing job designing our patio, firepit, irrigation system, landscaping, backyard lighting and updating our front lighting. 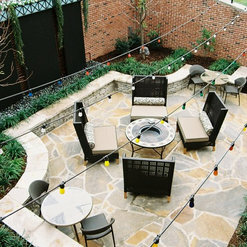 We absolutely love our new outdoor space. The team at Poynter is very professional and friendly, everyone was very easy to work with. They helped us pick out all the materials and made sure we were happy with how everything looked every step of the construction process. I highly recommend Poynter to anyone that is looking for high quality landscape architecture and construction. 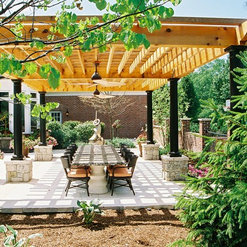 Commented: What are the dimensions of this pergola?Michelle. It is 14' x 24' at the posts however it extends beyond the posts a bit. Thanks and let me know if you need anything else. Commented: TravertineThe fabricators and distributors all seem to choose there own names for similar products so this may not help but I believe it was cafe. Commented: Cascading plantIt is a Sweet Potato Vine. They come in a deep Purple / Red foliage variety as well as the lime green. Easy to care for and likes lots of sun!